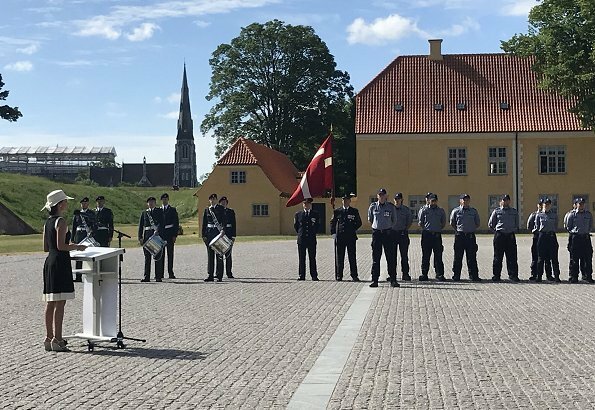 On June 6, 2018, Princess Marie of Denmark attended a memorial service with the Danish Emergency Agency (DEMA) at the Kastellet in Copenhagen. The ceremony was held for the Emergency Agency members who had been killed in action in Maglaj on June 1, 1993. DEMA's relief convoy was attacked near Maglaj in Bosnia. Two Danes and local translator lost their lives. On June 6 DEMA commemorates the 25th anniversary with a memorial service in Copenhagen. 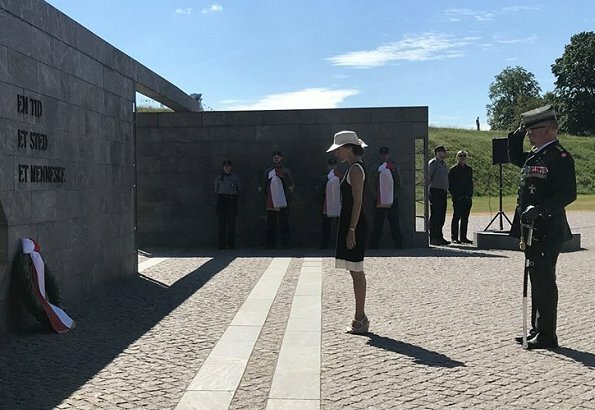 I am very impressed with Princess Marie of Denmark's service that commemorates the spirit of the Danish Emergency Agency members who were killed in Maglaj, Bosnia. Marie was perfect for this somber event. Dress is very nice and totally appropriate for this event. Not sure about the shoes, would like to see a better pic of them. More pics to come ??? Aren't there any pictures of Marie from the event, that are taken a little bit closer (front view) ? Lovely Marie. Dress and hat are a perfect match. Very flattering look. Great outfit, beautifully put together, hair perfect. Really nice. Marie macht sich sehr gut und Joachim hat echt Glück ! !